I don’t know about you, but I’ve been really worried about some things. I know I could try to sound all spiritual and call it “burdened,” not “worried,” and I’d like for that to be true … but it wouldn’t be. I’ve been weighed down, and weighed-down always equals worry. This morning, I was taking some of these things I’ve been worrying about to the Lord. In the middle of talking with Him about the things that have been concerning me, He interrupted me. 🙂 He told me to journal, because He had something to say to me. So I did. I listened, and He talked. What He said was so timely, and I felt like I should share it with you today too. After all, 2 Corinthians 1:4 tells us that all the comfort God gives us may be shared with others to comfort them also. So if you’ve been worrying about some things too, this is going to encourage you too (and please tell me about it if it does). You’ve been weighed down by heavy things. Things that matter. Weighty things. But beloved, I desire you to release them to Me, and I will make them light again. The responsibility is not yours. It is My Own. And I will take these things that bother you, form them and shape them, and conform them to the very image of My glory. Ask and you will receive, that your joy may be full. And I received that. It’s a simple word, and it’s not anything I didn’t already know in theory. But sometimes I forget to practice it, you know? So I turned over my cares about the people I love, the situations I’m involved in, and my own struggles to the Lord. And He has made those burdens light already. I also asked Him for specific things TODAY, because He wants me to ask so that He can answer and fill me with joy. 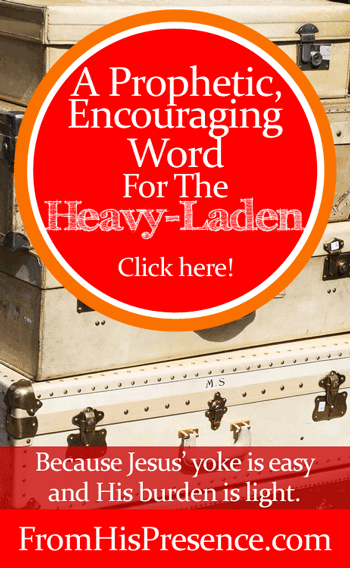 Do you also feel worried, burdened, and heavy-laden? Come to Me, all you who labor and are heavy laden, and I will give you rest. Take My yoke upon you and learn from Me, for I am gentle and lowly in heart, and you will find rest for your souls. For My yoke is easy and My burden is light” (Matthew 11:28-30). “For I have satiated the weary soul, and I have replenished every sorrowful soul” (Jeremiah 31:25). Heavenly Father, I come before You in Jesus’ name. I love You, Daddy. Thank You for loving me and taking care of me. Thank You for hearing and answering my prayer, and for caring about everything I care about. Lord Jesus, Your Word says, “Come unto Me, all ye who are weary and heavy laden, and I will give you rest.” So Lord Jesus, I’m coming to You right now. Please give me rest. I’ve been so weary and heavy-laden, and I don’t want to deal with these things anymore. Thank You, Lord God, that I can drop my burdens at Your feet. Heavenly Father, You see what’s going on with __________. Lord, I can’t fix this situation. But You can. I release it to You right now, Lord, and I lay it at Your feet. Lord Jesus, please take care of it. And Lord, I confess that I’ve been worrying, and I know that worry means I haven’t been trusting You. Father, please forgive me for worrying. I repent of it. Please forgive me and cover me with the blood of Jesus. Wash me clean, and fill me with Your Holy Spirit, and help me to release everything to You right now and trust You again. Heavenly Father, I choose right now to be anxious for nothing, but in everything, with prayer and supplication, with thanksgiving, I will make my requests known to You. And Your peace, which passes all understanding, will guard my heart and mind in Christ Jesus. I thank You for perfecting all things that are even a remote concern to me, Lord Jesus, and I receive Your peace right now. And also, Lord, Your Word says that if I ask, I will receive, and You will fill me with joy. So Lord, today I’m asking You for __________. I ask this in Jesus’ name, Lord, and I thank You that You hear me and that I have what I’ve asked for. I love You, Jesus. Thank You for fixing it. Thank You for taking away my burdens. Thank You for giving me rest. I choose to rest in You right now, Lord Jesus. I receive Your peace. I love You and thank You. Was this encouraging word for you today, too? If so, please leave a comment below. I’d love to hear from you! Thank you again Jamie for a timely word for me! I am worrying about so many issues right now and it is very heavy! I prayed the prayer above and I am going to be at peace today and trust God in all my circumstances. Have a blessed day! Awesome, Cindy! I know Papa will give you rest as He perfects all things that concern you today. Thanking Jesus with you! Thank you for reading and for sharing! My ministry has been suffering a blockage as of late and I am grateful for this prayer. Thank you. I pray that God would remove all hindrances and obstacles from your path, Shorna, and that He would make His way straight before you. In Jesus’ name. Thank you Jamie for a prayer in season. You are so in tune with the Holy Spirit. I am worried about issues such as finances work family. Thank you for this prayer. Although I have prayed. Sometimes wen u in the storm fear comes in like a flood. I just keep declaring the Blood of Jesus. Be blessed in Jesus mighty name. Hi Ricky. Thank you for reading. I’m so glad Father has blessed you. Keep on; you will overcome by the blood of Jesus and by the word of your testimony! Thank u so much!! This was RIGHT ON TIME!! Thank u Abba Father for using your chosen vessel. Bless her day! In Jesus name, Amen! Thank you for this beautiful prayer. It came at just the right time! God I’d so good! I’m printing it out so I can read it over and over again! Thank you! I’m so glad Papa blessed you! Thank you for reading, Cindy! 🙂 Have a wonderful day!!! This email was very timely. I was on the floor crying my eyes out due to an overwhelming situation. I was crying out to God, Papa help me! When I sat up and looked at my phone there was your email. I felt like it was just for me. Thank you so much. Blessings! Ok, Janice, now I’m gonna cry. GO JESUS! That’s awesome! #fistpump May you find rest in His overwhelming peace today! A thousand thank you’s, Jamie, for this awesome reminder of Who is really in control…Who can and will remove all burdens and worries…Who will fix what needs fixing. Just by asking. Ask, pray, and stay in faith .I have been carrying several burdens of my own and so needed this gentle reminder. I will carry this prayer with me. Thanking our Father for using you today Jamie. To help me and I’m sure countless others. Wow. I needed this. Amen! Thank you so much for letting me know, Debby. Jesus is so wonderful. I’m so grateful to Him for encouraging you! I hope you have a wonderful day! Thank you, Jamie, for your ear tuned to God. Although I am seeing the glimmers of light at the ends of tunnels and some early signs of progress towards visions long-promised, some days are too me-centred and fraught with worry in a dozen different directions. “Be still and know that I am God” has always been difficult for me. But that goes with pioneering, as you well know. I love your verse from Jeremiah “For I have satiated the weary soul, and I have replenished every sorrowful soul” (Jeremiah 31:25).” which is so amazing when you think of what that man endured in the role God called him to for the sake of a stiff-necked people. God has spoken to me through Jeremiah powerfully over the past four years. That ability “to stand, and having done all, to continue to stand” comes through such examples as Jeremiah, Jesus, and Jamie. I thank God for His anointing on your ministry. Laurna, thank you so much. Your encouragement means so much to me. I’m so glad you’re starting to see light at the end of that tunnel! Hang in there, dear sister! As I came to sit in my prayer corner feeling bogged down and overwhelmed, I began to speak(cry) out to the Lord. I prayed to him and mercifully asked for a word. I opened my email and Jamie, God’s word came forth through you. Only a loving, all knowing Father could do this. So I humbly thank you for being the hands and feet of Christ. Elma, when I got your comment, I was completely overwhelmed with gratitude. Thank You Lord for touching my sister with Your Word when she needed it. Thank you, Elma, for letting me know. I’ve been there many times myself, and I know how amazing it is to hear the merciful on-time word of God for your situation. We have such a good Daddy God. I desperately needed to read this today. My husband is out of work & we just had a baby. I have been anxious , worried & so frustrated. I’ve been unable to smile or enjoy the older kids. I needed this so much and will continue to pray this and confess it until it is true for me. Thank you! KB, I’m so sorry you’re going through that situation. I pray our Papa would provide all your needs during this time and comfort you and your family right now. May He bring you peace and bring you through this storm better off, somehow, than you were before. Lord, give her double reward for her trouble, in Jesus’ name! Thank you for reading! I will continue to pray for you! Yes that really helped me today my worries were overwhelming me today! Been worrying about my dog he is very sick and I am praying for him. I know most people would think this is crazy but he means the world to me! That’s not crazy at all, Deb. I hope your baby has gotten better? I’m so glad Papa encouraged you. Oh, bless you, Sister! I imagine that this must have been what those early churches felt like sometimes. Going through tribulations and *knowing* what our Savior has said and promised, yet… to receive that encouraging letter, such release and renewal! This was very much needed and appreciated. You are such a blessing. I pray that God would continue to increase your influence for His Kingdom, and honor you for your obedience. Thank you so much for that encouraging word, Kay. I receive it 100%! And thank you for reading. I’m so glad Jesus ministered to you today too. Have a wonderful day! This was given at just the exact moment that I needed it. I just read it today 🙂 Praise God from whom all blessings flow!!!!! Thanking the Lord with you! Isn’t it amazing how He saves things for just the right time sometimes? Go, Jesus! I’m so glad He blessed you, Sonya. Have a wonderful day! Thank you. We have been battling for our adopted 16 year old daughter’s heart. We are worried sick over her choices. She told us today Jesus isn’t her Lord. Savior, yes, Lord, no. Thank you for encouraging us to put this in His very capable hands. Kimmie, wow, it sounds like you have your hands full. Thank you for taking the time out of your day to share your story and also encourage me! 🙂 I just prayed for your daughter. May the Holy Spirit, the Hound of Heaven, go after her today and bring her back into Papa’s fold. Have a wonderful day. Blessings to you!! Thank you for reading! I. Can’t. Stop. Reading. Your. Posts. Lol:) I love your wisdom so! I am going to use that prayer, often, as I have a serious problem with letting go, and letting God:( THANK YOU, thank you, thank you, again for sharing!!! Marni, you made me laugh again. No need to stop reading… really! 😉 Seriously though, I do praise God that He used these posts to encourage you, and I pray He would continue to do so. May He water your soul with refreshing, healing rain from Heaven today. I thank God for you. I’ve been struggling with this situation of worrying and anxious. I’m going through for a while. But I thank God for using you to bring this prophetic message and prayer. I feel set free and have His peace that surpasses all understanding. Again thank you and may God bless and heal you. I thank God for you Jamie. I’ve been struggling with this situation of worrying and being anxious about a lot of issues. I’ve been going through for a while. But I thank God for using you to bring this prophetic message and prayer. I feel set free and have His peace that surpasses all understanding. Again thank you and may God bless and heal you. thank you Jamie for this powerful Word, something terrible happened to me yesterday and this message has just healed my soul….indeed we need to take all our issues to Jesus…..
am truly blessed by this message… God is so powerful..this message came at the right time. Thank you for this powerful message. Lord, I lay my burden down at your feet trusting you completely. Forgive me Lord for the times I chose to carry those struggles by myself. Fill me with your Holy Spirit and grant me Your peace. Thank you Holy Spirit for this message.